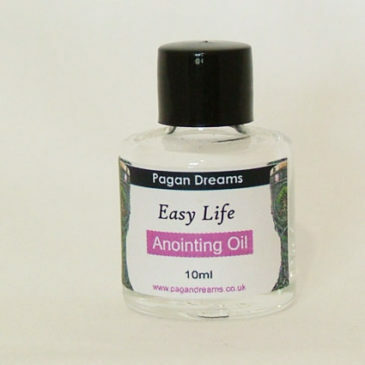 ““Use this magical anointing oil to anoint your altar at regular intervals. Request protection for your sacred workspace from the Deities.” “ Link to this post! ““Use this Black Cat oil for Hexing Breaking, Love and Luck. Anoint lottery tickets, bingo tickets, gambling tickets for luck. Anoint body for personal luck and love.” “ Link to this post! ““Use Angel oil to increase psychic awareness, call spirits from the angelic realm, attract friendship or love.” “ Link to this post! ““Use Cleopatra oil to draw and bewitch a lover. To keep two lovers together in harmony, sprinkle a couple of drops on lighted grain incense and add a hair from each of the couple.” “ Link to this post! ““Anoint the palms of your hands, your feet and your throat with court oil before entering court , for a favourable outcome. Anoint and burn an orange candle before entering court for legal justice.” “ Link to this post! ““Use Easy Life annointing oil to attract the important things in life – good health, happiness and prosperity.” “ Link to this post! ““Add a few drops of Gentle Healing to bathwater, or massage onto the pulse points to speed up the natural healing process. Anoint Green candles with Gentle healing oils and burn in the sick room.” “ Link to this post! ““A carefully blended anointing oil to attract new business. Anoint green candles, the main entrance of the business premises, cash register, money or any other object relevent to business success.” “ Link to this post! ““Anoint the body with Horn of Plenty anointing oil to attract prosperity, success and happiness. Anoint the main entrance to the home or bussiness.” “ Link to this post! ““”Use Isis Anointing Oil for knowledge, wisdom and healing. Use a few drops in a ritual bath, anoint candles, sprinkle on sachets or anoint the body. “” “ Link to this post!